Restriction. 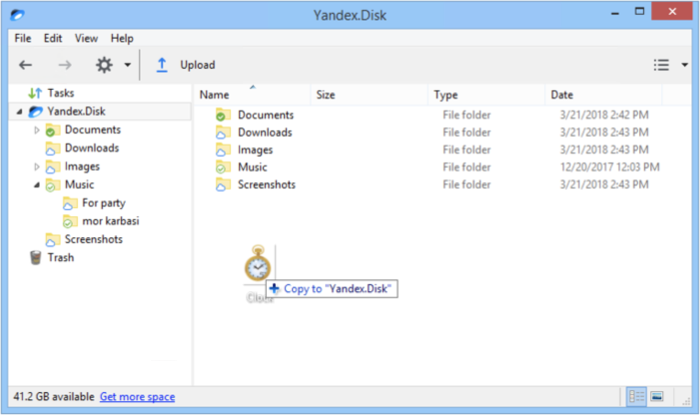 You can install Yandex.Disk in the following operating systems: 32-bit Windows XP Service Pack 3, Windows Vista, Windows 7, Windows 8 (classic interface), Windows 10. Download the program from the Yandex.Disk page. You will see instructions on how to run the file once it starts downloading. After installation, the Yandex.Disk program prompts you to enter your Yandex username and password. The icon will display in the system tray until you log in. If you don't log in right after you install the program, double-click on the program icon in the system tray. The sync status is displayed on the file or folder icon. To turn on syncing for a files or folder, select them in the list and click the Save to computer button above the file list or from the context menu. When the file is synced with the computer, the icon changes from to . After this, you can view the file in the Disk folder: click Show in Explorer in the file's context menu. 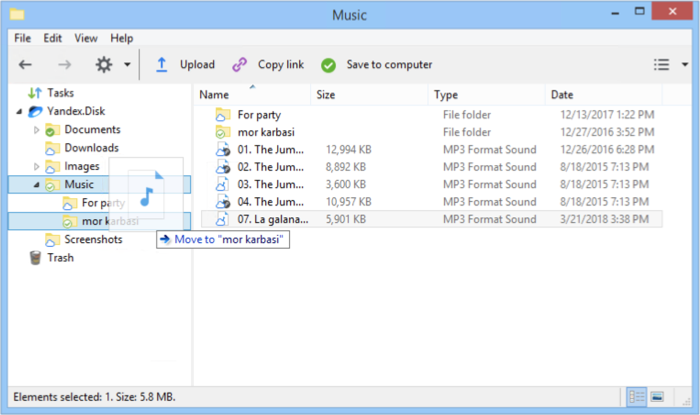 To do this, choose it in the list and click the Keep online only button above the file list or from the context menu. When a file or folder is removed from the computer, the icon changes from to . Open the Disk folder in File Explorer and drag or copy the files to it. This way files are saved both on the computer in the Yandex.Disk folder and in the Yandex.Disk cloud. Tip. We recommend that you copy and not drag and drop files. If the upload fails, you will be able to try again. Copy the files to the program window. This way files are saved directly to the Yandex.Disk cloud and aren't stored in the Yandex.Disk folder on the computer. Note. To save files and folders uploaded from the program both in the cloud and on the computer, right-click Yandex.Disk in the left menu and turn off the Save new files and folders online only option. Click the Yandex.Disk icon in the system tray. Turn on the Show drop zone on desktop option. To remove all completed uploads from the list, click → Delete all completed uploads from the list. To open a file for viewing or to make changes, double-click on it in the file list. The file opens in the default program for this file type. If you want to open a file in a different program, enter that program as the default for that file type. 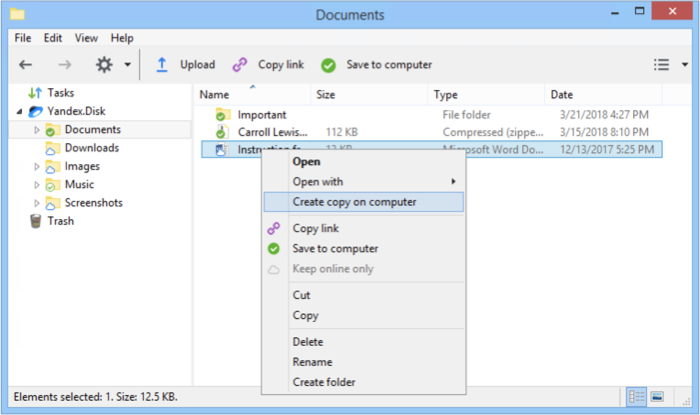 In the context menu of the file or folder, choose Create copy on computer. You can see the file download progress in the Tasks section. When the file is downloaded, you will see a pop-up notification in the lower-right corner of the screen or in the system tray. Click the notification to open the folder with the file. To move an item, drag it to the appropriate place in the folder tree on the left. If you want to move an item to a subfolder, open the main folder in the tree first. Choose an item and click Copy link above the file list or from the context menu. If you click on an empty field inside the folder, then you can copy the link to that folder. 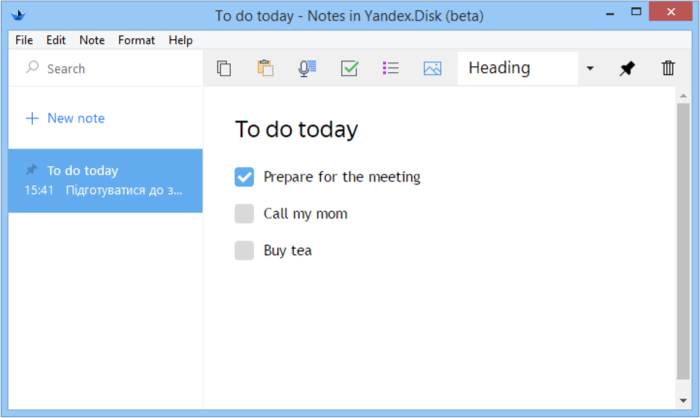 You can create notes with the Yandex.Disk program. They are automatically saved online so you won't lose them if something happens to your computer. 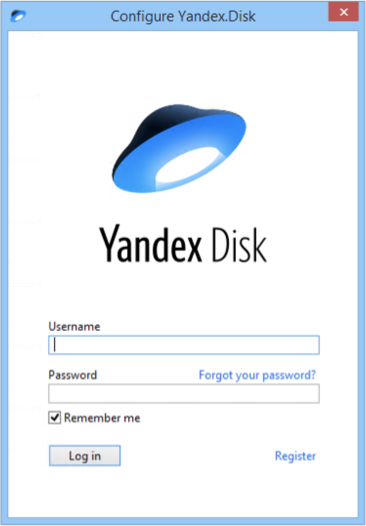 You can also use notes on several computers at once, for example at home and at work, if you log in to the Yandex.Disk program with the same username. Restriction. Notes are only installed on a computer with an operating system version 7 or higher (Windows 7, Windows 8, Windows 8.1, Windows 10). You can use text dictation and add a to-do list, a bulleted list, or an image in the note. To keep an important note at the top of the list, pin it. Choose it and click the icon in the upper-right corner. Read more in the Screenshots in Yandex.Disk for Windows article. Hold Ctrl and click View help. The folder with the selected ZIP archive opens automatically. Open the File Explorer, copy the link %LOCALAPPDATA%\Yandex\Yandex.Disk.2 and insert it in the address field. Archive the contents of the folder that opens and attach this archive to the feedback form. Open File Explorer, copy the link %USERPROFILE%\Local Settings\Application Data\Yandex\Yandex.Disk.2 and insert it in the address field.